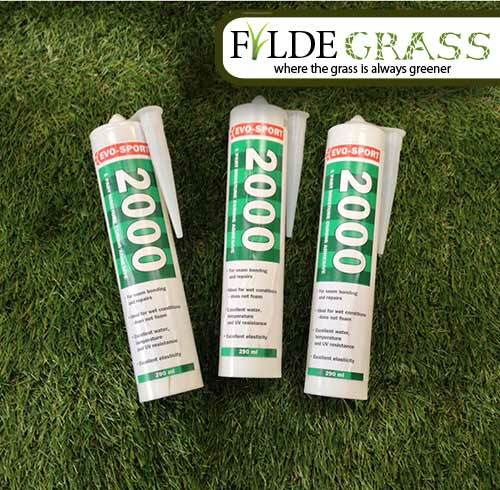 Our artificial grass adhesive is a single component moisture-curing artificial grass joining adhesive of a trowel viscosity designed for bonding artificial grass to a variety of substrates or jointing tapes. The adhesive is tolerant to use in damp and cold conditions, with the final bonds being fully resistant to climatic conditions. (1) Check that the substrates are clean, dry and free from contaminents. (2) Bead out the adhesive from left to right in a zig-zag pattern down the tape. (3) Use a serrated trowel to spread evenly. (4) Weight the bond to ensure a flat, even joint.